Please read the License Agreement for more details about the rights granted by the three different licenses. It is a great advantage if your images are organized in thematic collections. You will be able to sell Digital Collections with the 3 license options - Standard, Extended and Ultimate and you will have separate individual galleries in the Galleries-Tree for the whole Digital Collection and if applicable also for every category included. Please send us a notification via email before you upload the images, so we can create a separate categories on the Site for your Digital Collection and its Categories if applicable, where to upload the files. Please note, that every Collection or Category must include minimum 50 images in the same design style or thematic area. Furthermore we are going to create for you the Collection offers for every Entire Collection and every single Category also. 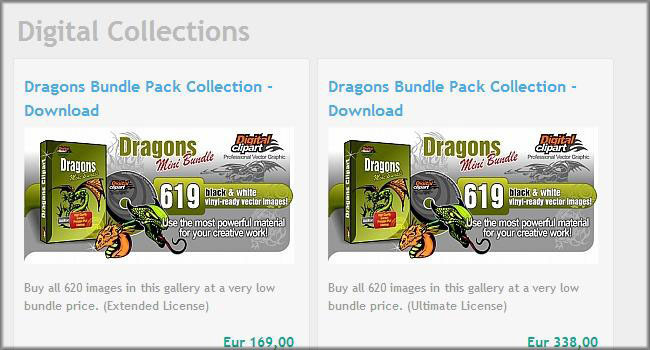 For this we will need from you the prices for the different licenses (Standard, Extended, Ultimate) you want to sell as well as Cover Images for better appearance of your Collections and Categories. Users that don’t need an entire collection you can offer single categories of your collection as Digital Collections for download with the 3 license options - Standard, Extended and Ultimate. If a user wants to buy several images they enjoy discounted custom packs. All discounts are at the cost of PVA. You get the full commission for all images! If you offer Single Images on the Site customers will be able to use purchased Prepaid Credits for buying Single Images and Custom Packs whenever they want. In this case the customers has not to make payment transactions for every Single Image they need and in addition there are Discounts up to 25% on Prepaid Credits. All discounts are at the cost of PVA. You get the full commission from the FULL GROSS PRICE BEFORE DISCOUNTS! If you would like to sell your images on CD/DVD, please contact us for more details. In general by selling a collection on CD/DVD you can offer customers the 3 licenses issued by PVA - Standard License, Extended License and Ultimate License. If you have another license on your prefabricated CD/DVD customers will have the right to use either the license issued by PVA or the license on the CD/DVD depending on their needs. The ReDesign License is a great opportunity for experienced illustrators and graphic designers. 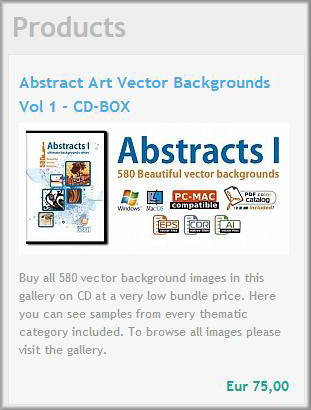 If you as a "ReDeisgner" have a vision to create a new derivative artwork collection using graphics published on the Site, you can use this option to request and acquire the original files FOR FREE and realize your idea. In one collection you can integrate graphics only from the same Artist / Studio as well as graphics you own the copyrights for. Your idea and if you are not an Approved Partner also your work quality have first to be approved by our experts and after that you can launch your project. Once the new graphics are approved by our experts, the files will be enabled for sale on Professional-Vector-Art.com. The new collection has to match highest quality and creativity standards and has to include at least 50 graphics in order to be approved. If your artwork has not been approved, you will receive a recommendation how to improve it. If the artwork is not sufficient qualitative or creative after the improvements it will be not enabled for sale. Both you and the Studio / Artist of the original graphics earn commissions from every sale. For the purpose of the sales tracking a separate Joint Account will be created for you and the Artist of the original graphics. The Copyrights of the new artwork will be managed by PVA with the restriction for sale only on Professional-Vector-Art.com trough the corresponding Joint Account, unless the parties agree on something else. If you are Contributor of original graphics and want to enable other designers to create new derivative artwork from your images after approval - ReDesigns, to sale and earn commissions from the sales of these ReDesigns, you have to select the ReDesign License in section "Pricing" when uploading or editing your images. If you have any questions about this great opportunity, please feel free to contact us. The member can purchase the desired modification comfortably by using the Pricing Calculator displayed below and choosing Modification Type, Difficulty, Urgency and Number of File Formats needed. To purchase a custom modification work the member has first to purchase a license for the original version of your image. This license will be valid also for the modified image. But there is even more value in this great service. PVA can use the modified image at the same time as a ReDesign and can publish it afterwards on the Site for sale in the Joint Account between PVA and you - the Contributor of the original image. Please take a look at the Custom Modifications Page, where you can find detailed information and samples of the available modifications types and difficulties. PVA is publishing the Custom Modification option on all images. 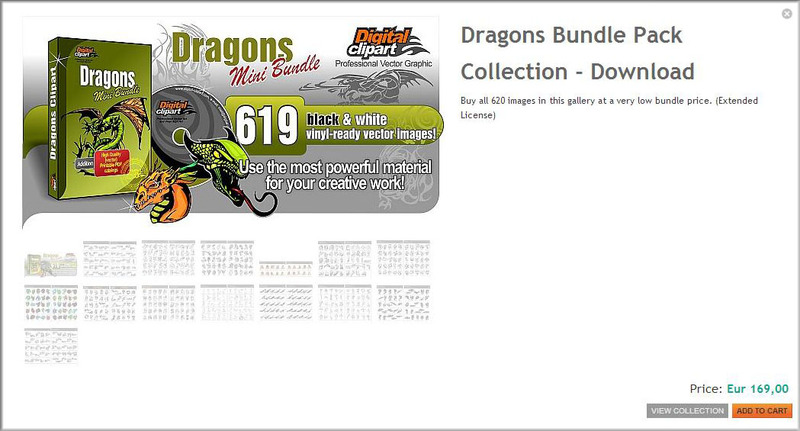 You can select this option by yourself too in the pricing section to every image. Please leave free in this case both the Price Field and the Credits Field. Step 1/4. Register by clicking on the “Become a member” button in the upper right corner. In order to be able to upload and sale, you have to choose Contributor Membership by agreeing to the Gerneral User Agreement and to the Contributor Agreement. 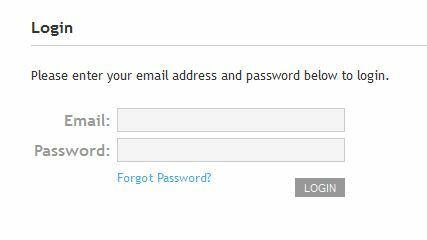 Login using the designated login form. Step 2/4. Upload your content by clicking the “Add New Media” button on the left. Select the files that you want to upload and drag them into the window. You can upload up to 1000 files at once but we recommend to limit the batch upload to 500. If you plan to sale images in multiple formats you have to put them first into zip archives. The name of the archives should contain entire words and keywords (like Vector, Clipart, Background, Image, Graphic, Icon etc.) for better compatibility with search engines. If you are uploading an entire collection of e.g. 150 images the name of the files must contain a number/id with 3 digits. Name templates like cart_anim_col_8.zip are not optimal; Use instead name templates like - Cartoon_Animals_Color_Vector_Clipart_008.zip. You may use of course some internal code of yours in the names e.g. like a prefix fc84_Cartoon_Animals_Color_Vector_Clipart_008.zip. Step 3/4. After the files are uploaded a form containing four sections will appear. In the Albums Section you have to create New Album for your images or choose an already created album, where to add the newly uploaded images. If you upload an entire collection we highly recommend to create a separate Album for it for easier administration in future. If you upload single images it is highly recommended to organise them in thematic Albums e.g. Animals, People, Ornaments, Christmas, Party, Wedding etc. In the Galleries Section you can choose the galleries which are most appropriate for your media. If you upload a collection of images we will create an individual Gallery for it to stand out in the Galleries tree. You can associate your images also with all other appropriate thematic galleries by selecting the main gallery (1st level in the galleries tree e.g. Abstracts, Animals, Fonts, Foods & Drinks etc.) and the "All other" category in the main gallery. 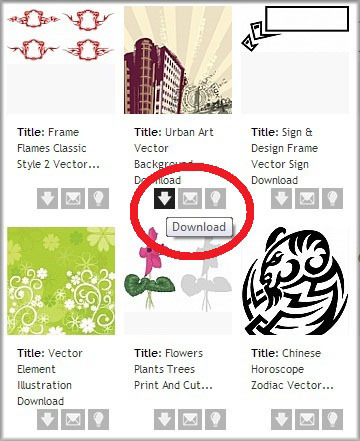 If you upload single images you can select only the main galleries and the "All other" categories. The Details Section is divided into four subsections: Title, Description, Keywords and Media Types. You can place the content in the text fields in multiple languages easuly by clicking the "+" Icon next to every field. If you are uploading a collection or a category of collection or similar images in a batch, you have to place in the text field Titles, Description and Keywords, that fit to all images in the batch. If you want after the upload you can make a finer optimisation of Titles and Keywords image by image. The Keywords that you write should be relevant to the uploaded media, so it would be most convenient for the users who search. You can find appropriate keywords by asking questions like - what is on the image, what is it doing, how and with what emotion is it doing it as well as what are the main secondary obejects in the image beside the major object. 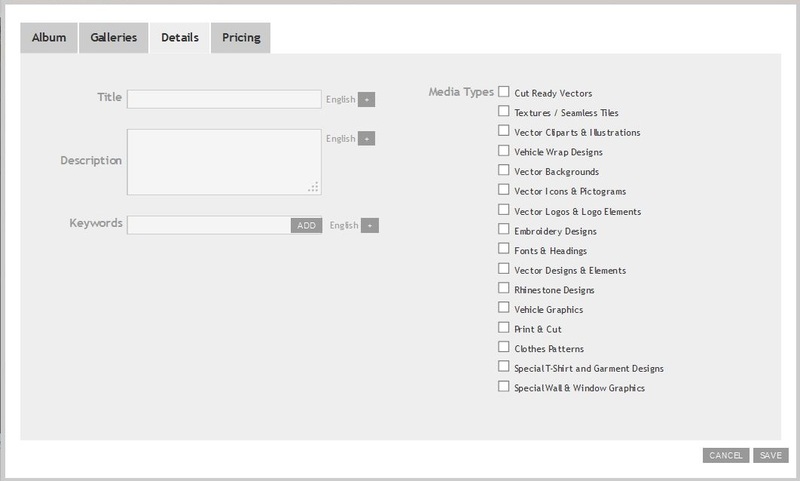 Media Types - here you can choose the media types that are most appropriate for your images. Step 4/4. Uploading Thumbnails is the last step of the importing process. After you have uploaded the Original Files for sale (in general in a ZIP file) your media should look like below - without thumbnails. The upload of thumbnails (JPG) is in single mode - for every media separately. You have to click on the Edit button under every image and a window called Edit Image Details with 4 Sections will appear. In the Details Section in the upper right corner you will find a button Upload Thumbnail. The system puts automaticaly a watermark on all images. The system generates automaticaly an Icon, a Gallery-Preview Thumbnail and a Sample Thumbnail for every image. The Zoom function on the Image Details Page is working only if the uploaded thumbnail is more than 450 px wide or high. For great eye catcher effect we recommend a width or height of ca. 650 px. If you prefer you can delegate the uploading of your images to us. For this service we charge eighter a Setup Fee and Per Image Fee or we pay out -5% Sales Commission on all future sales. You have only to provide us with the original files via ftp. Pleas contact our customer support for more information. If you have already an account, you may take advantage of the support ticket system in your profile. We wish you success! If you have any questions, please feel free to contact us! We will be glad to help! If you have already an account you can take advantage of using the Support Ticket form in your profile.